Organizing our things on the way they should be is always be the best method to find your items immediately, makes your home/adobe neater and clutter free. When you organized your things properly, it is truly a pleasing to your eyes, mind and body. There are so many different procedures to be organized, we can donate the stuffs we don't need anymore, we can sell them to earn extra income or if not because there are things that worth keeping that has a sentimental value we can always store them in our storage. There are free boxes, that we can save that looks sturdy enough to hold our items, we can be creative and make them something stunning rather than leaving it in their plain and boring label. I did keep a few of the diaper boxes and make them something useful and creative for my storage as I needed more storage for my children's toys. However, today I will ditch that idea and will try something new. 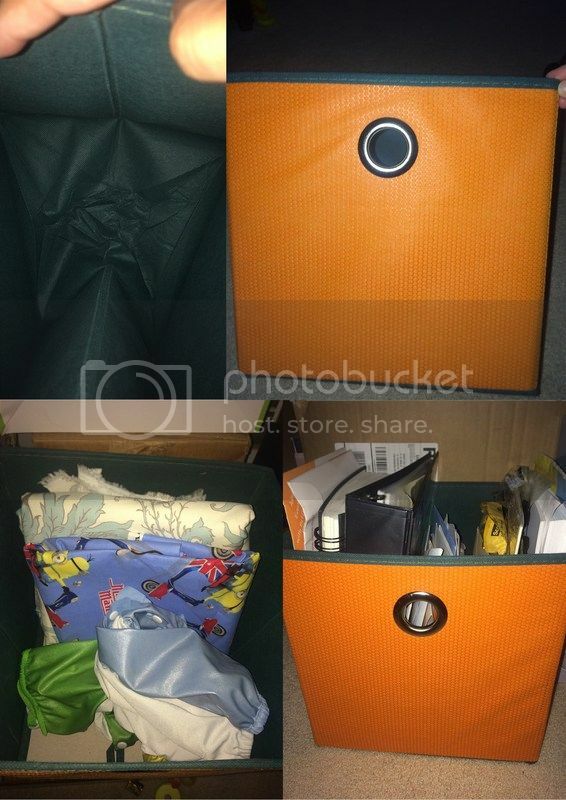 Today, I have the opportunity to review a nice foldable storage box a set of 3, peel orange with Phthalo green lining from HomeSutra Lindsay. · Cute & beautiful! With a unique embossed bubble pattern, these storage boxes will add charm to any setting. Pair with matching or contrasting accents in your room to give it that extra oomph! No wonder why everyone is so impressed by your style. · Looking for superb quality and excellent craftsmanship? Unique metal handles provide you with an extreme amount of usage, while making them look classy. Say NO to cheap handles that tear-off with light use. · Dare to think outside the box? Add charisma to your living room, bedroom or that huge walk-in closet you are so proud of. Or store your precious collection of records in the most stylish way imaginable. Organization is the key to productivity, isn't it? · Intimates, magazines, towels, toys, bathroom supplies and much more! We can think of a hundred ways to use them. What about you? · Our mission is to be environmentally friendly. By using recyclable non-woven polypropylene, these storage boxes help us achieve that goal. The addition of high strength cardboard makes the boxes an ultimate storage device. The packaging of the product is great. It arrived in the mail in a great condition. I don't see any signs of damage in shipment that I was able to open and examine the item right away. I'm very happy and satisfied with it. There were set of 3 so for the price itself, I would say just about right for you to pay for the item. Very easy to use, since it was folded and can be folded if it's not used, I manage to unfold the storage and attached the hard cardboard for the base. I didn't see the base part at first thinking that, it's an awful storage because I don't think it would sturdy enough to carry the things inside when I carry it. I was wrong, there were cardboard and that need to attach to the bottom and that makes a huge difference. The storage stays unfolded after I put in the bottom. I like the kind of material it is also made of, it is perfectly sewn well, that only means one thing these storage are indeed sturdy. The dimensions are 10.6 x 10.6 x 10.6 inches, I would say just about right side that I need for a storage. The orange color also attracts my guests or anyone who sees my new cool storage. Very lightweight too. Easy to keep and to carry. I will recommend this product and would definitely buy for another set for more storage and would have a uniformity of the once I received. This is perfect for toys! 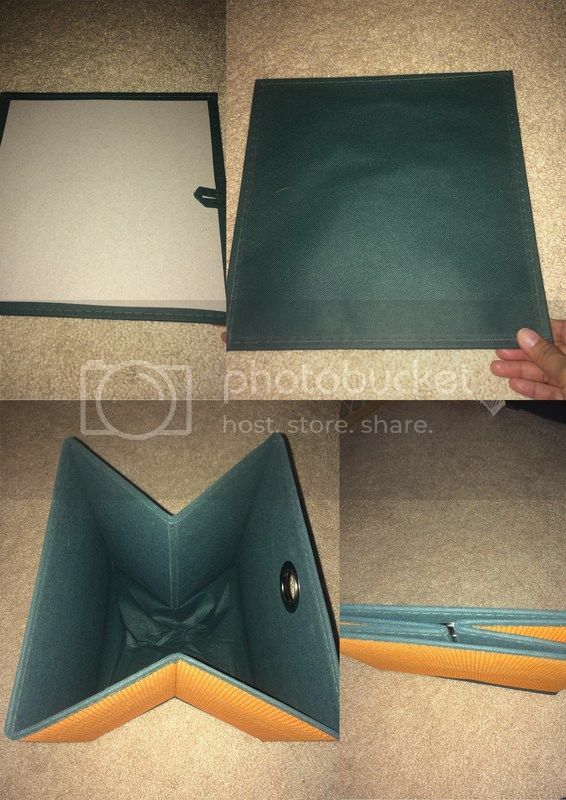 I love that it's foldable, it saves a lot of space! I love these foladable storage. I have two that I bought in the store and planning to get some more. The box looks durable. What a pretty box to get out stuff organized.